Traffic is the amount of data sent and received by visitors to a website or blog. 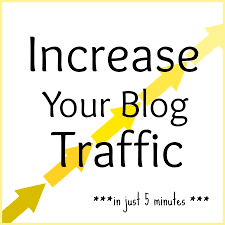 To Increase your blog traffic or visitors, it has to take months to gain new visitors, but the most valuable way is that you need to get good and unique content on your blog and also try sharing it on social media, forums like Facebook, twitter and many more. You might be thinking buying of blog traffic is the best way but let me tell you the truth it is not recommended, try making things natural by getting unique visitors. There are also other ways to get get some quick burst traffic like doing blog commenting on high ranking or profile blogs posting on forums that gets huge traffic daily and also making a viral image or infograhic for social media. This are 10 meaningful ways on how to increase your blog visitors. 1. Many blogs and forums do allow banners ads so try to find some in your niche and make a banner so as to advertise there. 2. Writing of good blog post submitted to Reddit and also composing a guest post syndication. 3. Publishing quality content on a regular basis optimized with researched keywords that has good amount of traffic with low amount of competition. 4. Making sure that all your articles has a great title and encourage sharing by making it possible to create good content valuable for your market. 5. Try to open a Facebook page and add your contents or articles in this Facebook page an link them back to your blog I think by doing this you can get started with creating your traffic. 6. If you want fast traffic from the social network try using Google adwords, Facebook ads, stumbleupon paid traffic, solo ads and the create a target and advertise to the appropriate location. 7. Try to make your site more mobile friendly and easy to load and navigate. 8. Make or create your ranking high with the search engines so that your link comes up first page or second of Google search results. 9. Create a time to visit other blogs that are in the same niche with you and build up a rapport with other bloggers who will also visit and share your articles. 10. Use the link of your blog in any forum signature. Read Also:- How To Make Money By Freelancing staff And Advertising. Sure you have more to add to this why not drop it in the comment box thanks.